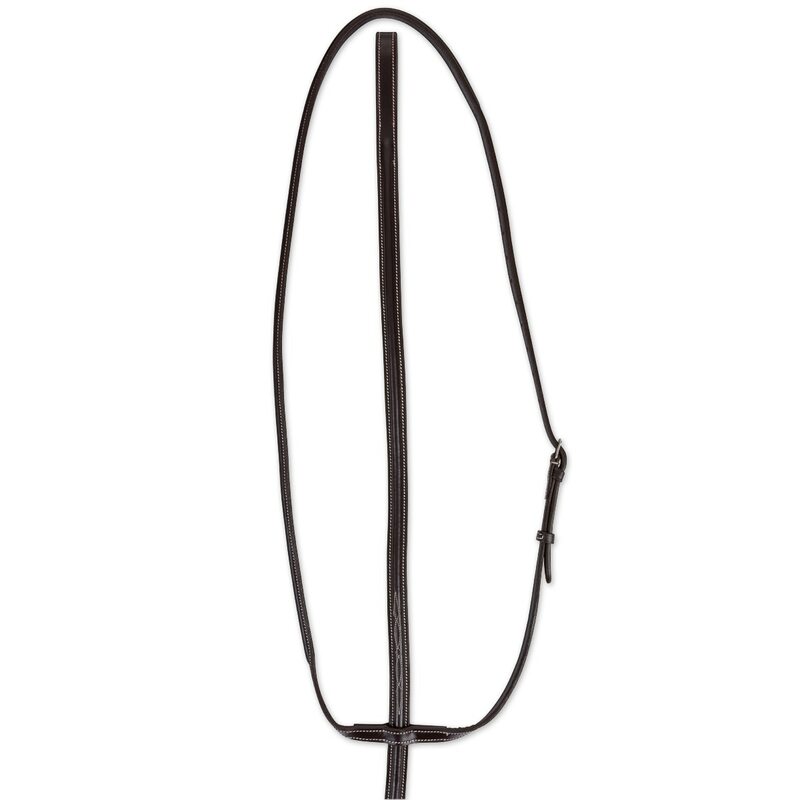 The Plymouth® Fancy Raised Standing Martingale is perfect for everyday use and priced to make it an unbeatable value. Made from durable, imported leather, this martingale features classic styling, fancy stitching, and a beautiful chocolate color that will look great in the ring. Plymouth® Fancy Raised Standing Martingale by SmartPak is rated 4.7 out of 5 by 59. Rated 5 out of 5 by Marie from Nice leather quality Very nice quality and love the dark color! Fits well on my large Warmblood. Rated 5 out of 5 by Samantha from Nice Martingale! Looks more expensive than it is and needed to be conditioned, but is super soft and bendy after that. it’s got a lot of length to it, which is great for my 17hh TB, but it can be adjusted smaller if needed. Rated 5 out of 5 by Luana from Plymouth Plain Standing Martingale by SmartPak I bought the Plymouth Standing Martingale by SmartPak about a month ago, and I was very pleased with the quality of this product based on it's price. I first ordered the pony size, for my 14.3hh Arabian mare, however it was too small. So I exchanged it to the full size, and I prefer the way it fits now. Customer service was helpful and awesome, as always! :) This is an affordable option, it's well made, and it looks very nice. I recommend to order the rubber martingale stoppers to help to keep the martingale in place. Rated 5 out of 5 by Ali4 from Great Martingale for the Price! I purchased this to match my Plymouth bridle. Great looks and quality for the price! Rated 4 out of 5 by Klshenkel from Great for the price Bought this with little expectation other than the fact that I was needing a cheap martingale. But so far I am very happy with it. All of the Plymouth products I have purchased have not let me down...thanks SmartPak!!! Rated 5 out of 5 by Horsin Around from Professional look! Needed a standing martingale for our small Palomino Quarter Horse who is 13.3H. The pony size fit him perfectly and looks great with room to tighten or make larger! If I were to add anything, it would be a way to attach& release it faster from the cinch-a buckle or snap. Very happy with the product. Rated 4 out of 5 by Horsefan from Great matching Martingale I bought this because it matched the bridle I also purchased. It looks great however we noticed it did not come with a donut so the martingale would not stay fitted. After purchasing the donut for $1.29 at a horse show we were happy that it now stays in place. Rated 4 out of 5 by maritime from Beautiful martingale I bought this martingale a few weeks ago for an upcoming show, it has beautiful stitching and is a great value for the price. Smartpak's shipping was fast & the martingale arrived earlier than scheduled. Rated 5 out of 5 by Chrissy from Great martingale Bought this a month ago to use for schooling with the matching bridle. Works really nicely and the leather is very soft. Rated 4 out of 5 by Melanie from Recommended I find this to be a good product. I have a pony who is 14.2 and the pony size is just fine. Only thing is, it absolutely needs a rubber donut. Otherwise I would highly recommend.